Ridgefield High School is partnering with Providence Heart Institute (PHI) to offer all students in grades 9-12 a free heart screening during the month of November. 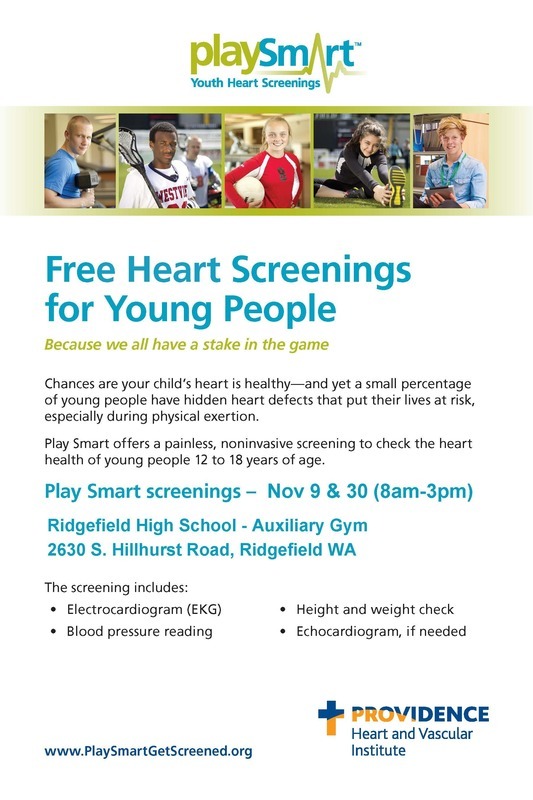 PHI’s program, called Play Smart, will provide screenings on November 9th and November 30th from 8:00 am to 3:00 pm in the Auxiliary Gym at Ridgefield High School. To receive the free screening, students must complete a Consent Form and Questionnaire and submit them to the RHS Athletic Office. The forms are available here: Consent Form and Questionnaire. The Play Smart Youth Heart Screenings Program has been extremely successful in screening over 25,780 youth and identifying 1,328 students (6% to date) for further follow-up treatment. Young people with undiagnosed heart defects, especially athletes, are susceptible to sudden cardiac arrest. Often, there are no advance signs or symptoms. An electrocardiogram (EKG/ECG) is usually necessary to reveal signs of heart irregularities, something not normally done in “well-child” checks or routine physical exams. Play Smart heart-health screenings are free, painless and non-invasive. For more information about the Play Smart Youth Heart Screenings Program, visit their website at www.playsmartgetscreened.org.